Have you and your team been ordering from the same spot for months now? Is lunch together at the office getting predictable? Or do you have a meeting coming up and want to make sure guests enjoy every detail of their time with your team? Even though business is business, every detail, including food, makes an impression on your team and guests. Switch things up and make your next office lunch something everyone will appreciate and remember. Sandwich platters are, for lack of a better term, played out. If you’re catering to impress or treat your team, this isn’t the way. It’s time to step it up. We know sandwiches are normally the easiest, cheapest option, but there are plenty of alternatives that are just as easy and crowd pleasing. Let’s be real, sandwiches aren’t even really that crowd pleasing. Try switching it up and serving other single serving dishes like flatbreads and salads. Present an array of different styles people can choose combos like at their favorite cafe outside the office. It’s a step up from the sandwich. Grabbing a Panino con Porchetta or Caprese Bruschetta and a single Marinated Egg Plant Salad is much more satisfying than a turkey and cheese sandwich. Your team or guests will appreciate it. You know what’s also over done? Box lunches. Not only are they super inconvenient, but your staff likely orders the same thing every time. Instead of having to take everyone’s order every time you get lunch catered to the office, surprise everyone with a buffet of new options outside of the norm. Tray dishes are a great way to serve a bigger amount of people without the hassle. They’re usually more cost effective as well. For many offices, we do tray dishes of our favorites: kale pesto rigatoni, spaghetti Bolognese, and more Italian classics. These days, there’s likely more than one person who chooses to eat differently. Instead of having to cater and single them out each time you go to make a lunch order, or god forbid, forget they exist, make their option available. There are plenty of dishes that meet dietary needs and are so delicious people won’t even notice. Many restaurants these days are conscious of dietary needs and wants and work this into their menu flawlessly. Go for these options to save time, money, and to avoid missing someone. This way is much ore convenient and everyone is guaranteed a good meal. For example, we serve fresh, handmade, gluten free pasta. We have vegetarian and vegan options for sauces as well. Learn more about our dietary options for catering. Office lunch doesn’t have to mean boring and simple. Many caterers drop the ball with large orders in terms of quality. Gourmet can be catered and guests and staff will very much appreciate it. Have a restaurant that takes preparation and quality of ingredients seriously cater. All of our dishes, even though made in bulk for big office teams, are made with the same care and quality of our individual dishes in the restaurant. We made all pasta by hand the traditional way for your trays and sauces are crafted with the same quality ingredients. It doesn’t have to be a budget killer, either. Our catering prices are comparable to many other options; just higher quality! 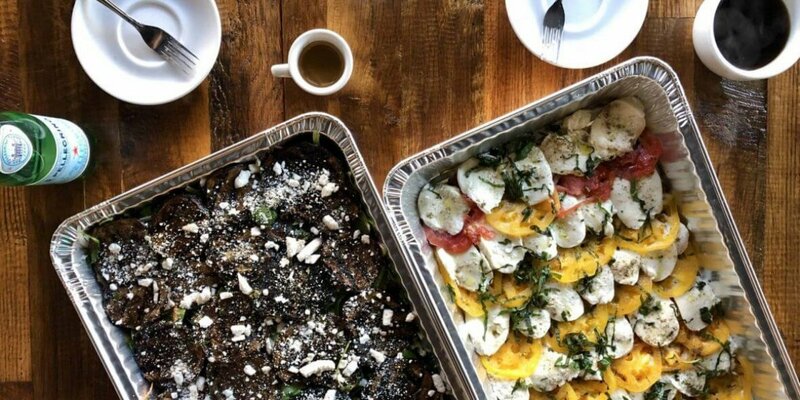 Get $30 off your first office catering order with Due’ Cucina and change the meaning of “office lunch” entirely.